Communicating and getting the attention of your customers in such a splintered digital world these days is not only daunting but in many cases downright impossible. Do they listen to radio? Maybe only online radio or satellite. Do they LIKE you on Facebook? If they do are they seeing your posts? There seem to be more questions than answers. Mobile can play a role in answering these questions and moving your marketing strategy into a much more successful, measurable place. One area we hear more and more about in the mobile industry is location. Location marketing can help you reach your customers even when they aren’t standing on your showroom floor. Here are a few key terms you may have heard in recent months but you surely will hear as you delve deeper into mobile opportunities. Location-based services (LBS): A general class of computer program-level services that use location data to control features. Geolocation: The identification of the real-world geographic location of an object, such as a radar source, mobile phone or Internet-connected computer terminal. Geolocation may refer to the practice of assessing the location, or to the actual assessed location. Geo-fencing: The practice of using global positioning (GPS) or radio frequency identification (RFID) to define a geographic boundary. Geo-fence: A virtual perimeter for a real-world geographic area. Geo targeting: The method of determining the geolocation of a website visitor and delivering different content to that visitor based on his or her location, such as country, region/state, city, metro code/zip code, organization, IP address, ISP or other criteria. Proximity marketing: The localized wireless distribution of advertising content associated with a particular place. We keep this list short for the sake of this article but you must understand you have the ability to reach your customers not just on their mobile device but you can reach them based on their physical location. It’s always been of interest to me that a major part of marketing for powersports dealers is finding ways to drive customers AWAY from the dealership. Now that sounds crazy but as you plan events you often find off-site locations to conduct rides or even a local restaurant for an evening or afternoon to just gather like-minded enthusiasts in one place. Your customers expect this from you and eagerly participate. But ultimately you make it more challenging on yourself to stay connected to these customers. This is where using the mobile channel to market to these customers whether they are at your dealership or at an off-site event you’ve organized. In 2014, 150 million users were accessing location-based services on their mobile devices. $6.6B will be spent on location-based US mobile advertising in 2015, compared to $7.34B for non-location-based. 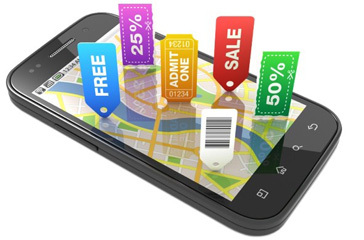 47 percent of mobile consumers want retailers to send coupons to their devices when they are in or near the store. Location-based ad efforts were about twice as effective as the mobile industry average click-through rate (CTR) of 0.4 percent. 66 percent of marketers believe location-based advertising is the ‘most exciting’ mobile opportunity for 2016. If you want to improve your customers experience while they are at your dealership you can give them enhanced proximity marketing experiences as well. You can choose specific areas of your sales floor or service department or parking lot so that when a customer visits this area you can send them messages based on what they are looking at or an offer they may not otherwise have known about. Planning and executing a promotion like this can seem complicated. But the truth is it can be done quite easily and very effectively when you find the right mobile partner to help guide you. Your customers don’t have the “creepy” factor because they have opted in for this communication and they will come to expect more from you when participating in events such as this.